The technology team has a leading role to play in a company’s effort to reduce its environmental footprint, a role that extends far beyond comfortable dialogues around data centers. But tech expertise is an underused resource in many sustainability programs. 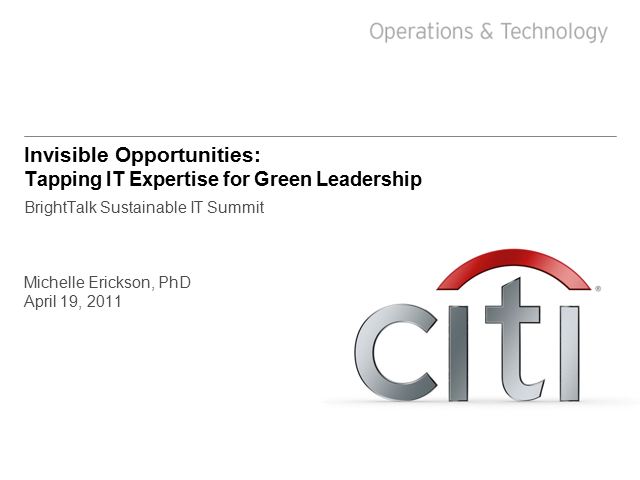 Citi will offer ideas on why this occurs and give examples from its award-winning sustainability program of ways the tech team can be better leveraged to build enterprise-wide awareness and understanding. Key to this effort is helping non-technologists understand the system as a whole and the down-stream implications of even their smallest actions.